Persons who suffer traumatic brain injury often have problems with vision, dizziness, and balance. About 59% experience visual problems, and about 78% experience balance problems. Vestibular system, which starts in your inner ears and continues along the vestibular pathways of the eighth cranial nerve to the brain. This system feeds the brain information about the position and movement of your head in space. Visual system, which provides your brain with visual information about the world around you including objects that move. Proprioceptive system, which supplies information about motion, posture, and balance from receptors in the muscles and joints and forwards this information to the brain. The three systems must work together to maintain your equilibrium. Your brain processes information from these three systems and then merges the information. You can develop balance problems because of damage to the areas of the brain responsible for processing this information (a central problem) or from damage to any of the three systems (a peripheral problem). The forces of acceleration and deceleration that cause brain damage during a traumatic event such as car wreck can cause damage to vision, the inner ears, and the proprioceptive system. We all know that the term concussion is used to describe mild traumatic brain injury as a result of trauma. A similar phrase, vestibular concussion, is used to describe damage to the inner ears. Signs that you may have a balance disorder include dizziness, nausea, lightheadedness, vertigo, motion sickness, coordination problems, slowed reaction time, bumping into objects, and falling. An Ear, Nose, and Throat (ENT) doctor with a subspecialty in neuro-otology can diagnose and treat balance problems. A number of objective tests are available to diagnose the cause of balance problems including an electronystagmography (ENG), dynamic platform posturography, rotary chair study, computerized tracking, and cognitive position testing. Treatment options include medication, home exercise, and vestibular rehabilitation guided by a physical therapist or occupational therapist. It is wise to treat visual-perceptual problems before starting vestibular rehabilitation therapy. A neuro-optometrist should evaluate you before you begin vestibular rehabilitation. We “look” with the eyes, but we see with the brain. Traumatic brain injury can cause visual dysfunction including blurred vision (46%), double vision (30%), vestibulo-ocular reflex problems (33%), convergence insufficiency (14%), and accommodation disorders (16%). You may become sensitive to light or fluorescent light, be unable to remember what you read or see on television, or become disoriented or nauseated by objects that move in or out of your peripheral vision. You may also have problems with depth perception and clumsiness. Vision is fundamental to all your perceptual functions. The cause of many of these problems is a condition known as Post Traumatic Visual Syndrome (PTVS) and its variant, Visual Midline Shift (VMS). Both conditions are caused by problems with your Ambient (Magnocellular) Visual Pathway working with your Focal (Parvocellular) Visual Pathway. 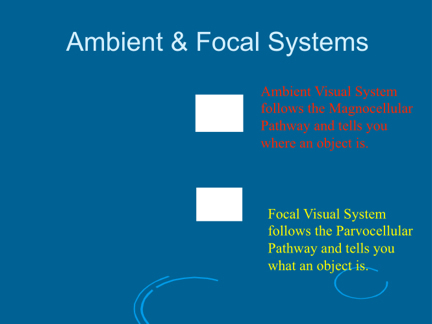 The Ambient Visual System tells you where objects are in space, while the Focal Visual System tells you what these objects are. Another way of thinking about the two systems is that the Ambient Visual System lets you see the forest and the Focal Visual System lets you zoom in on one leaf on one tree in that forest. Most importantly, the Ambient Visual System guides the Focal process. Dysfunction in visual perception results in incorrect information being sent to the brain. Post Traumatic Visual Syndrome results from a neuro-event. Damage to the Ambient Visual System leaves it unable to properly support the Focal Visual System. Interference with cerebral blood flow and cerebral glucose metabolism ultimately leads to cytotoxic damage to neurons and axons in the brain. Head trauma may also leave you with Diffuse Axonal Injury involving damage to brain cells in a wider portion of the brain. 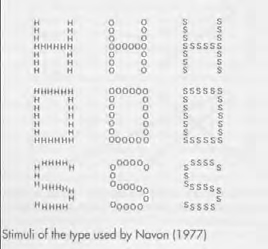 All the large letters in the third column are small Ss. The Ambient Visual System always provides the brain with the first visual information represented by the large letters and then directs the brain’s attention to the small letters within the large letters, with that detail being processed via the Focal Visual System. With Visual Midline Shift, the visual center of your world shifts to the left or right or up or down. Sometimes there are shifts in two directions. Scientists believe that changes in the ambient processing of the midbrain, often with altered sensorimotor inputs from posture, balance, and proprioceptive systems, result in Visual Midline Shift. Few optometrists or ophthalmologists have the background necessary to diagnose and treat these problems. Optometrists and ophthalmologists are very good at helping patients with visual deficits or eye diseases. However, they generally have not received additional training necessary to work with patients who have suffered visual dysfunction resulting from a neurological event such as a stroke or traumatic brain injury. You will want to see a neuro-optometrist or neuro-ophthalmologist who has this additional background. These specialists offer objective tests such as electronystagmography (ENG), Clinical Test of Sensory Organization and Balance (CTSIB), visual evoked potentials (VEP), and otoacoustic emission (OAE) tests. Neuro-optometrists treat Post Traumatic Visual Syndrome and Visual Midline Shift with therapeutic prisms and other non-invasive techniques that optically change the inaccurate visual information that your brain receives so that it matches the reality of the visual scene. This results in your brain altering its “software” to match the correct visual stimuli. The purpose of this site is to provide basic information, not medical or legal advice. The information is intended to be accurate, but no guarantee is made as to its accuracy, completeness, or being up to date. The owner of this web site is a lawyer. This site may be construed as advertising and promotional materials. Do not use the information on this site as an excuse to avoid seeing a lawyer. If you have a legal problem, you should seek the advice of a competent lawyer. Normally if you talk or write to an attorney, neither you nor the attorney can be forced to share the contents of what was said or written. Some courts do not follow this rule when it comes to e-mail. Also remember that most e-mail is not secure. So be careful about sending any e-mail information about your legal problems. The transmission of an e-mail request for information does not create an attorney-client relationship.